The UAB School of Public Health celebrated Public Health week with activities such as Public Health Research Day. Awards were distributed for the top three posters from faculty, staff, postdocs, and students. 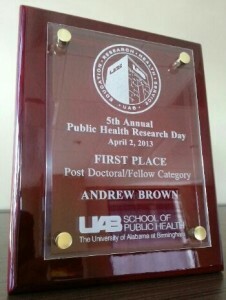 I was honored with first place in the postdoctoral category. Congratulations to the other winners! The Nutritional Epidemiology Research Interest Section of the American Society for Nutrition has named me one of three finalists in the post-doc category of their research competition scheduled at the Experimental Biology Meetings in Boston. Alabama Public Health Association (AlPHA) held their meetings at UAB this April and held inaugural poster session. Having won the post-doctoral division of UAB’s Public Health Research Day on April 2nd, I was invited to present my work on breakfast and obesity at AlPHA’s session on April 4th, and was awarded third place in the poster competition.